We are continuing our study in the Gospel of Matthew. And we will be specifically finishing with the study of Christ genealogy. In verse 11, we find that Saint Matthew skips Jehoiakim but includes Jechonias. Jechonias deserves our attention because God had said that none of his seed would sit on the throne. "And Jacob begot Joseph the husband of Mary, of whom was born Jesus, who is called Christ." You see that this breaks the pattern which began as far back as verse 2 where it says that Abraham begot Isaac. From then on it was just a whole lot of "begetting" and verse 16 begins by saying, "And Jacob begat Joseph." You would expect it to continue by saying that Joseph begot Jesus, but it does not say that. Instead, it says, "Jacob begat Joseph the husband of Mary, of whom was born Jesus, who is called Christ." Obviously, Matthew is making it clear that Joseph is not the father of Jesus. Although he is the husband of Mary, he is not the father of Jesus. In Verse 17 we find a statement which will explain something in the genealogies. 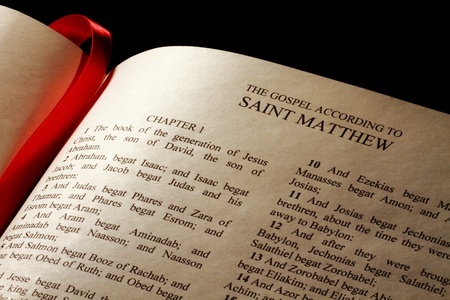 Saint Matthew puts the genealogy into groupings to give an overall view of the Old Testament history. One era extends from Abraham to David, another from David to the Babylonian captivity, and the third from the captivity in Babylon to the birth of Jesus Christ. Obviously, he has omitted some names from the genealogy in order to fit fourteen into each period. The question is, why did he do this? Apparently the number fourteen (twice seven) offered some proof concerning the accuracy of this genealogy. Now that Matthew has shown that Joseph is not the father of Jesus, he is going to give us an explanation. Already in the Old Testament, a supernatural birth has been predicted by God. Jeremiah is talking to the nation of Israel when he says, "How long wilt thou go about, O thou backsliding daughter? for the Lord hath created a new thing in the earth, A woman shall compass a man." That's not the way it is done. That's not natural birth; it supernatural. "the work of the Incarnation was a new work, of which it is said (Jeremiah 31:22): "The Lord hath created a new thing upon the earth." "Concerning Mary we read of a great miracle in the same prophecy Jeremiah 31:22 — that a woman should compass a man, and that the Father of all things should be contained in a virgin's womb." says concerning Jeremiah 31:22, that the "new thing created in woman is the body of the Lord, conceived within the virgin without the co-operation of man." The New virgin birth of the Lord Jesus is the "new thing" which God has done. And it is the fulfillment of Jeremiahs Prophecy.